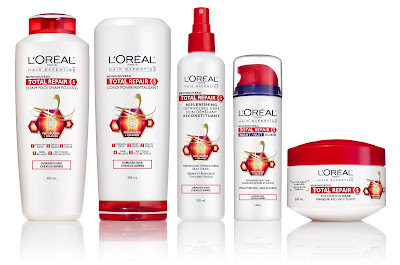 L’Oréal Laboratories have developed a Pro-Keratine and Ceramide enriched formula that helps restore 5 visible signs of replenished hair without weighing it down. L’Oréal Paris Total Repair 5 Repairing Mask is concentrated with an active serum for deep, intense repair. The light texture softens the hair, without weighing hair down. A little while back I received the Shampoo, Repairing Mask and Repairing Spray from this collection in my prize bag that I won from L'oreal at the Toronto Beauty Blogger meet up. Now if you remember a long time ago I blogged that I don't use shampoo anymore and just use conditioner to clean my hair....so well that means I have not used the shampoo and therefore will leave it out of my review. In addition to the 3 products I recived there is also a conditioner and a Night Elixir. 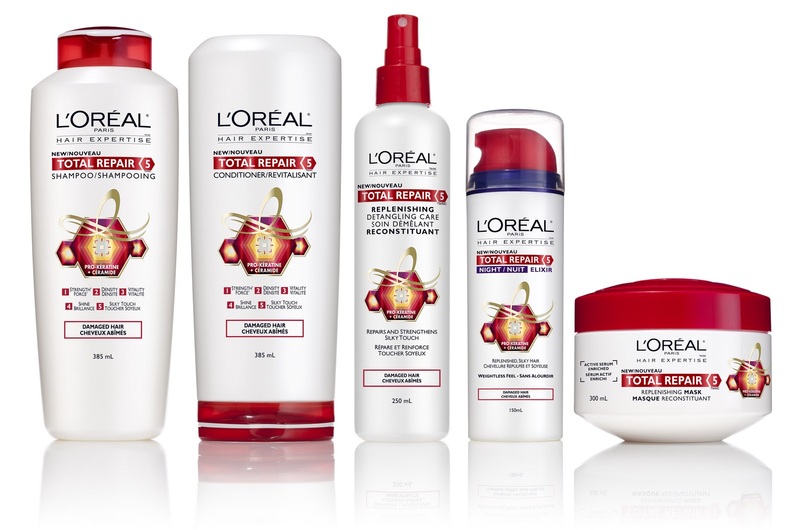 This whole collection is all about repairing your damaged hair and keeping it feeling and looking its healthiest. From what I have seen from my use over the last few weeks it really seems to keep my hair as healthy as possible without the heavy feel or residue of other strong repair systems. L’Oréal Paris Total Repair 5 Repairing Mask is concentrated with an active serum for deep, intense repair. The light texture softens the hair, without weighing hair down. 5 Problems. 1 Solution. This comes in a nice big tub, which is always nice for a mask, but always annoying because I fear dropping it in the shower with my wet hands. It doesn't have a super thick texture or feel to it, but once put in my hair I instantly can feel how it smooths it out and makes it feel healthier. It reminds me a lot of the little conditioner packs you get when you use at home hair colour. I always wished they made that stuff giant tubs and now it seems as though they do. Once rinsed (after 5 mins or so) my hair is left light, soft and with tons of body. While I don't have fine or limp hair, sometimes hair masks and heavy repair conditioners leave my hair feeling more greasy or heavy. Since I stopped using shampoo this has become more prevalent a factor in my conditioner choices. I am really surprised at how much I am loving this mask. It has slowly replaced my regular conditioner. L’Oréal Paris Total Repair 5 Repairing Spray provides daily restoring care as effective as a classical conditioner. Quick and easy to use, your hair is weightlessly detangled and has a healthy-looking shine. 5 Problems. 1 Solution. So often I find that I love leave in conditioning sprays but never end up using them. I find I use them as refreshes and end up hating the smell of them and how they grease up my hair quickly. This is not the case at all with this product, it leaves my hair weightless and soft. I really love it. It seems to be unlike any other type of leave in conditioner I've used in recent years. The mist is super fine so there is no over spraying one sections, the smell is mild and nice and my hair feels wonderful. So although I have yet to use the shampoo, I am sure it is great, but I just don't use shampoos anymore. The mask rocks the spray is fantastic. I am going to go out and buy the Elixir and regular condition in the next few weeks. I cannot wait to see how the Elixir works to repair overnight and if the conditioner works 1/2 as well as the mask it will be well worth the buy. I will repurchase these products and cannot wait to try the rest of the line out.